Friday's action put a dampner on the week's action. How did the Stockcharters see it? 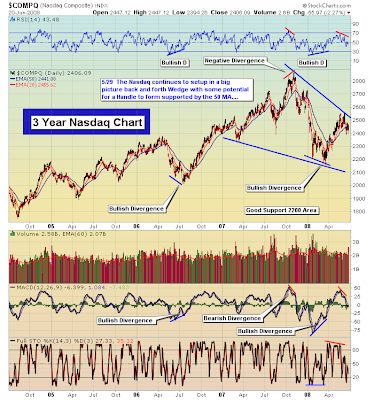 We got a wonderful sell signal on May 20, as the DJIA broke its intermediate trendline which was confirmed that very day with a bearish direction indicator (DI) cross on the ADX indicator and bearish confirmation on the MACD. The following day on May 21 the S&P 500 broke down and it got a bearish DI cross. Moreover, on May 26 the Aroon gave a sell signal on the DJIA. The S&P's 500 sell signal came on June 2, as the first right shoulder formed on the S&P 500 near 1400. We also got excellent candlestick reversals at the 200-day SMA , as shooting star reversals appeared on both the DJIA and the S&P 500 on May 19. 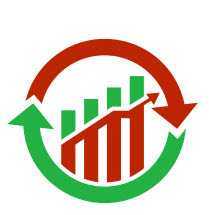 Because we listened to our indicators, the ultrashort position trades we entered on May 20, have now reaped the rewards, with DXD (UltraShort Dow 30) posting a gain of 16.75 % and SDS (ultrashort S&P 500) swelling up almost 15 %. That's just in one month! If you regularly read this blog, you know I've also made quite a bit swing trading the QQQQ, SPY, QID, SDS, and DXD since May 20. I suggested to start selling on May 5, the day after the DJIA had first tagged its 200-day SMA. Exactly two weeks later on May 19, a second attempt to move above the 200-day SMA failed, and we have been floating down stream with the current ever since. This is why the buy and hold strategy doesn't work, had you taken that strategy you would be giving back all your gains right now. I personally had over a 10 % gain on SPY during the March to May run up, and even a better run on the QQQQ and Transports. Not only have we made money since May 20 by playing the short side, but we played the long side from March 18 to the May highs in our ETF position trades. But what if you fail to trust your indicators, you may find yourself off track. I've been there before. Technical indicators have a remarkable way of predicting the mathematical probabilities, in determining whether or not support will hold or if prices have the momentum to break above resistance. 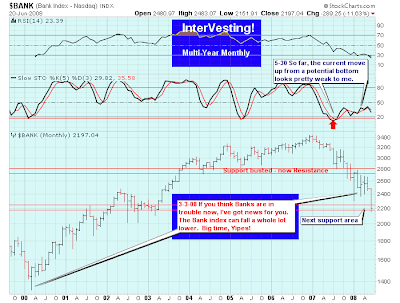 Our crystal ball of indicators has foretold countless reversals, and kept us out of harms way on numerous occasions. They have helped us by letting us know when to limit exposure in the market when times get dicey. We have access to a wonderful arsenal of indicators, which helps cut down on all the noise, as they give us our marching orders. You may say, hey things are going great here and ignore your technical indicators. or what if I get mixed technical signals and happen to follow the wrong indicator? or what happens if you just plain flat-out misinterpret the chart all together? You may take an action and really goof things up. What do you do if misread your technical incators? What do you do if you take a step, a leap of faith, and do something that you think is right, but for whatever reason it was a wrong call. Do you just wander around aimlessly, lost in unproductivity and confusion? Following technical indicators is kind of like these wonderful global positioning systems (GPS). This female voice tells you were to turn, such as 'make a right at the next exit.' But the awesome thing about a GPS system is, that if don't take the right turn it doesn't yell out you, condemn you or nag you! It doesn't say, I told you so, or shut down, or give you the silent treatment. Neither does it hound you to stop and ask for directions. You men ought to love this technology! It just this nice sweet voice, that automatically reprograms another route, and readjusts until you eventually get to where you are suppose to be. Even if you take several wrong turns, it just keeps readjusting until you get to your destination. The GPS doesn't condemn you, it doesn't yell at you, it doesn't nag you and niether do your technical indicators. The GPS system is there to guide regardless if you keep wandering in the wilderness or lose you way. It just gives good directions, and so does technical analysis. But you say, what if I don't hear the directions properly or if I just choose to go on in the wrong direction because I'm stubborn. Well, then you may have an accident or get stuck in traffic which may lead to road rage for those of you living in California. But ultimately the system will get you back on track. Because the fact of the matter is, that the GPS just recalibrates and eventually you'll find your way. And the same is true for you, if you have made mistakes or dropped the ball a time or two, you can still get to your destination. It isn't too late for you. It's just taking you a little longer to get there, because you've missed a few turns along the way. The issue isn't taking a wrong turn, the issue is am I en route to my destination. Because if you pull off to the side of the road and put the car in park, and yell 'I give up,' you'll never get to where I ought to be. You have to start moving and eventually you find your way thanks to the wonderful technology of the GPS. The same is true with reference to our wonderful technical indicators. If you apply yourself and get in sync with the technical indicators, eventually you'll find yourself back on track and headed for your destination. 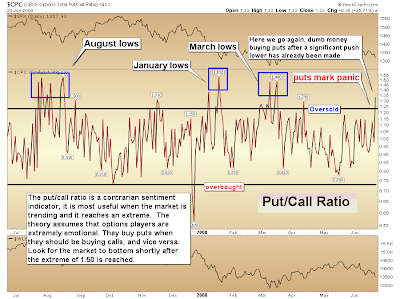 Watch the put/call (p/c) ratio (2nd chart down), this contrarian indicator assumes that options traders buy puts when they should be buying calls. Thus, the p/c ratio moves to extremes above 1. The p/c reaches panic when it reaches the 1.50 level. Think about it, we have been short since May 20, and during that time the DJIA has lost over 9 %, declining by 1186 points, and there are traders that are just now attempting to buy puts. I have an exit strategy in place and am looking for long opportunities. The market could still move lower and reach our objective target of 1300 on the S&P 500, but I think we are closer to a bottom than a top. There are a lot of folks betting on a bear market here, whether they get it is another thing. But the pessimism has produced bargains and whenever my technical indicators tell me to jump back on the long side, I will. The pessimism has also allowed us to make a lot of money betting against this market. I will be peeling off my gains on my short plays and looking for long entry points in the days ahead. I took 3 new swing trades on QQQQ, SPY, and DIA. Additionally, I closed all swing trades on the ultrashorts. See my trading list further on down. 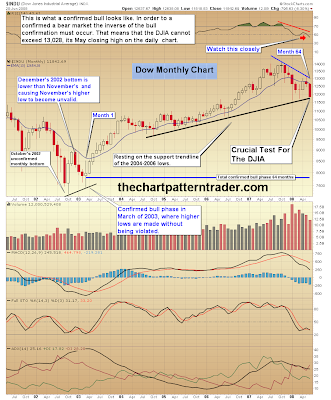 The DJIA is at crucial levels on the monthly chart. Prices need to reverse in order to bounce of the 2004 rising trendline of support. Should they break below and fall 20 % below the October closing high, it would fall into the classification of a bear market. Personally, I'm betting against the bears and I don't think the market will slip into a bear market. But remember the monthly chart doesn't get its final print until June 30. The Saudi's announced that they plan to pump another 200 K barrels of oil a day. The Chinese raised fuel prices in order to dry up demand, and President Bush is trying to pressure congress to lift the ban on offshore drilling. If crude oil puts in a short term top here the market should carve out a bottom. But the Saudi Arabia oil summit this weekend may help resolve some of the oil problems for the short-term, putting a band-aid on it to stop the bleeding. However, it will likely be short lived, due to the mounting tensions between Israel and Iran. Israel cannot allow Iran to develop nuclear weapons. The Conference Board's leading economic indicators posted its second consecutive gain last week, casting serious doubt that the US will enter a recession. But I don't think the recession junkies will believe economist Ken Goldstein from the Conference Board. I like Ken Goldstein, I think he has his head screwed on straight, unlike a lot of other economists I read. He's batting a 1000 so far. Are the banks at a bottom? 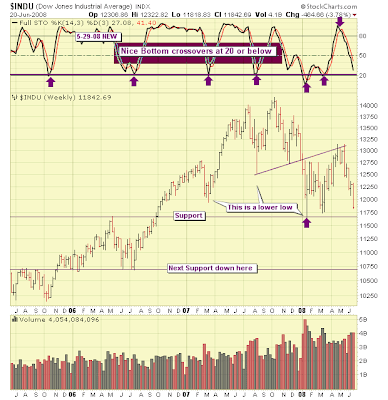 Ted Burge leads with a chart showing the loss of the 50-day and 200-day MA for the NYSE. But it may find support at 8,840. The sector to watch! Bullish Percent below 30% and when it reverses, you will be one of the quick or one of the dead. The 'real quick' bought support on June 12th and are ahead of the game! We have covered this sector on video every day in the second week of JUNE. 6/20 -- That was nasty for an expiration day. We may be oversold enough to get a bounce going again, but short term trends are still intact and long term channels harbor the possibility that we may ultimately see much lower prices still. I think the small caps are particularly vulnerable. I caught up with the Elliott Wave folks (Free week at elliottwave.com)and they are saying that what I am calling the 'A' wave correction is really the end of wave (2) already and we are now in wave 3 down. Wave 3 is always the most powerful and longest wave in the general trend direction. That is an extremely bearish scenario. I don't necessarily agree, but at least you should know. 6/19 -- Maybe a tad more positive now in the very short term but otherwise little has affected the short term downtrends that have now been in place for weeks. I tweaked a number of channels tonightg. The longer term trend channels are fairly wide, setting us up for a wide trading range in which the markets may meander all summer. 6/18 -- Nothing really positive. We're approaching the lower lines of our now long short term downtrends, but aren't there quite yet. SHort term downtrends and minis abound. XTC broke down. XLE hit its upper line, but would YOU want to short the oils?? 6/17 -- We pulled back today but remained in the short term mini uptrends of the past few days. The Dow came right to the purple downtrend line, touched and backed off. We should bounce off lower lines on the major indexes tomorrow for another upswing, but be alert to the possibility of a break as always. The Financials did break down, so stay clear of those. 6/16 -- On the 5-minute charts, everything on the major indexes continued in trend today except for the XLE and XTC. The bounce was able to shrug off bad news in the morning and depressed S&P futures -- that's the good news. But the bounce is triangulating upward(best seen on the Nasdaq 5-min chart in pale blue) instead of channelling, and that tells me it may not last.